Some dogs love to ride in the car while others are not keen on the trip. Whichever category your pooch belongs to, having a proper dog crate makes car travel much more enjoyable for both of you. The private space keeps your dog steadier which helps with dogs that suffer from motion sickness. The floor of the dog crate keeps the potential mess of your dog confined to an easy to clean space. A dog crate also protects your car from any dirty paws. 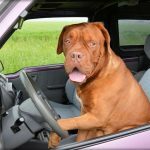 Here, we will list what you need to know to pick out the best dog crate for your car and four-legged friend. This Fellie dog crate is the right one for your medium sized buddy. It measures at 89x69x50 cm which is a comfortable size for many medium sized breeds. This larger crate is not collapsible but it is easy to disassemble and reassemble. There are six parts to the dog crate, namely the floor, roof, two side walls and front and back panel. The reason why this crate cannot fold is because of its highly sturdy and therefore durable design. The crate is made of quality aluminium and strong plastic sides that cannot be chewed through by your dog. The entrance of the dog crate is a double door with a pre-fitted lock. This front-panel of the crate also slopes for a better fit in the boot. This trapezium shaped dog crate is the right choice for a stronger dog because of its durability. Example of a car where this dog crate will fit into is a Skoda Octavia. Examples of adult dog breeds that the crate is an appropriate size for are Border Collies and Labrador Retrievers. The Ellie-Bo 30 inch crate truly is deluxe. It even comes with a fleece liner and training guide to make the dog crate experience more enjoyable for your dog. The crate measures at 54x76x54 cm and slants at both the front and sides which lets the crate fit into most hatchback cars. 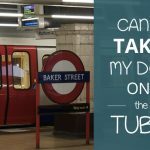 This is the appropriate size for smaller breeds like a Shih Tzu or a Cocker Spaniel. The bars are four mm thick so they will keep your dog safe inside. As will the heavy-duty latch doorway. You could opt for the extra precaution of fastening the dog crate with bungee ropes. You also don’t have to worry about your chewer because the floor tray is made of steel. The fleece liner will make the floor more comfortable for your dog. At the same time, the tray is removable so it is also easy to clean. 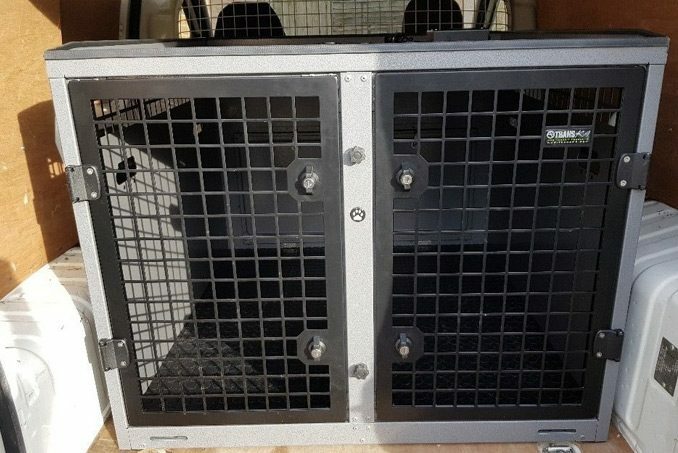 Examples of cars where this dog crate will fit into are a Renault Corsa, Hyundai Ioniq, Renault Clio, Kia Sportage, Seat Ibiza and Ford Fiesta. Examples of adult dog breed that the crate is an appropriate size for are Cocker Spaniels, Wheaten, English Springer Spaniels and Jack Russels. The Cozy Pet deluxe crate was designed specifically with cars in mind. The designers took great care in making sure that the dog crate could fit into most cars. The dog crate measures at 44.5x62x49.5 cm which is a smaller size and so fit for smaller breeds. Both the front and back panel of the crate are sloped which lets you place the crate further inside the boot. The crate also has two doors, one in the front panel and one in the back panel. This is a safety measure that Cozy Pet has installed in case of an accident at the back of the car. With this design you will still be able to release your dog from the dog crate by dropping down the front seat and opening the back door. This dog crate is also a great choice for warmer and sunny weather. The black finish doesn’t create a blinding glare for your dog and the sturdy wires provide plenty ventilation. Also, the tray is made from a strong ABS material that is also easy to clean. A great extra feature of this Cozy Pet dog crate is that you get the option of ordering the crate with a fitted bed. This saves you the time you would otherwise spend on trying to find the right sizes lining. 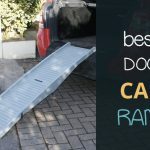 Examples of cars where this dog crate will fit into are a Nissan Xtrail and Renault Scenic but the manufacturer claim that it will fit into most models of all car brands. Examples of adult dog breeds that the crate is an appropriate size for are Cocker Spaniels and Lurchers. This dog crate is the perfect choice for a show dog, even the larger breeds. The crate reaches quite high at 76x54x64 cm which lets your dog sit comfortably in the cage. The front is slanted which makes for an easier fit in the car, too. Kerble recommends this dog crate for dogs that participate in exhibitions or to bring along on your holiday trips. This is because the crate is lightweight and is fitted with a handle for easy carrying. The dog crate is also collapsible so you can store it in the car when not in use. Examples of cars where this dog crate will fit into are Ford Edge, Focus Estate, Peugeot 3008 and Ford C-Max. Examples of adult dog breeds that the crate is an appropriate size for are Cocker Spaniels, Bichons and an Irish Staffordshire Bull Terrier. 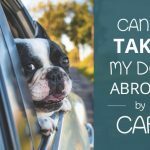 This is another dog collapsible travel crate that was designed specifically for cars. This crate measures at 82x53x51 cm. The front is sloped to make sure that it doesn’t bang into the boot window. The back of the crate is also sloped, there is a bend in the design which lets the crate fit just right against the back seat. This way, you won’t have to fold down the back seat whenever your dog is travelling in the car. Safety is also an important feature in this Arrow dog crate. The crate is made from zinc steel which sturdier than powder coated crates. Since the material is zinc steel, the crate is still lightweight too. A unique safety feature with this crate is the spring loaded top. The top panel is designed to open up in case of an accident. This lets you retrieve your dog from the create from an alternative panel. Also, there is a sliding bolt over the door. This makes sure that your dog cannot worm his way out. Examples of cars where this dog crate will fit into are a Ford Fiesta and Peugeot 206 and Hyundai i20 and Mini Cooper. Examples of adult dog breeds that the crate is an appropriate size for are Border Terriers, Border Collie’s and Coton de Tulear. For the smallest pooches there is the Ferplest Atlast mini carrier. This tiny and handy carrying crate is made from a durable plastic with wired sliding doors. This carrier can fit two toy breed dogs because it measures at 72x51x41 cm. You have the option of either keeping them separated with the provided divider or letting them snuggle together in the crate. This is a dog crate for the dog owner that likes products with a lot of extra features. The crate comes with a draining mat which helps to keep the space clean for your dog. There are two storage compartments that you can use to carry toys or a blanket in. There is a spring hatch in case of emergencies. Finally, if you don’t want to carry the dog crate, you can even roll it around because it comes with option of wheels. A plastic dog crate which is more enclosed will help out dogs that get nervous in the car. This Ferplest crate gives your dog less distractions as your furry friend is only able to see through the sliding front doors. You don’t have to worry about the crate being too hot, either. There ventilation in each panel to let in enough fresh air for your pupper. Examples of cars where this dog crate will fit into are a Honda CRV and Mini Countryman. Examples of adult dog breeds that the crate is an appropriate size for are Jack Russels and Miniature Poodles. 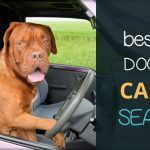 These were our top picks for dog crates to travel with in your car. We’ve taken care to choose the crates that are easy to clean and comfortable spaces for your dog. Remember to properly measure your dog’s height, length and width. This will help you decide on which dog crate size is the most appropriate for your trusted furry friend. Also, don’t forget to measure the boot of your car with the boot door closed. There might be a significant slope in the design of the car which doesn’t fit with every dog crate design. The most important aspect of a dog crate is its size. The crate should be big enough for your dog to comfortably stand in, turn around and lay down. You can easily find out what the appropriate size is by measuring your dog. There are three lengths to measure. The first one is the appropriate height. To find the appropriate height of the crate, measure from the top of your dog’s head to the ground. Add about eight cm or three inches to this length. This is how tall the dog crate should be. Second, measure how wide the crate needs to be by measuring the length from your dog’s snout to the base of the tail. It is not necessary to include the length of the tail in the calculations. Again, add about eight cm or three inches to this length. Finally, measure the widest part of your dog. Usually, this is above the shoulders and chest. Once again, add eight cm or three inches. This is the appropriate breadth of the dog crate. Don’t choose a crate that is far larger than the above suggested measurement. A dog crate shouldn’t be too big either because this might encourage Rover to pee inside the crate. Adult dogs purposefully do their business away from where they like to lay down and sleep. A dog crate that is too big gives your dog the space to do so. The best dog crate do come with a removable tray, though. So, in case your dog can’t hold it in, the crate will still be easy to clean. Another vital point is measuring the boot of your car. Imagine the disappointment of not being able to use a newly purchased dog crate because it doesn’t fit inside the boot of your car. Measure the length, the width, the height and the slope of the car boot before purchasing a dog crate. The slope of the boot is a measurement that dog owners tend to forget when shopping for a crate. Don’t be one of them. The slope of your car boot can significantly change how much space is actually available for the dog crate. Don’t despair if you have a smaller car with a low slope. There are still plenty of dog crate options for you. We’ve included several sloped dog crates in our selection of the best that you can buy on-line. Also, consider whether you would prefer a dog crate that is collapsible or not. collapsible dog crates are very practical, especially if you would like to leave the crate in the car. This lets you free up space for luggage and groceries whenever you need while still keeping the crate on hand.